Pilgrims, from left: Grady, Danielle, Fiona, Lynn, Mary, Mary Ann, Lisa, Denise, Millie, Mary, Mike. As we began our day, our group took a quick stroll through the historic Basilica di San Francesco. 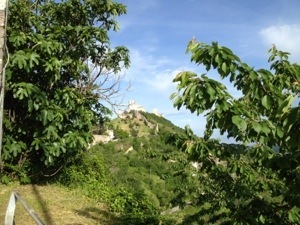 We headed to Basilica Santa Chiara and then left town, traversing Monte Subasio, to lovely Spello. Two weeks ago our prior group met Elizabeth, an Austrian pilgrim. Today we saw her here in Assisi, finishing her walk. Mike and Mary leaving Basilica Santa Chiara. This little fellow accompanied us for about five kilometers. A short day of walking left us lots of time to explore Assisi, especially the Basilica di San Francesco. Afterward we shared dinner and goodbyes with people we’ve come to enjoy and love over these weeks together. Many laughs and warm feelings as we said today’s goodbyes. Tomorrow at breakfast we share final goodbyes and I know there will be some tears. (Editors note: At our request, Bill Bennett, an Australian filmmaker and pilgrimage lover, has written his reflections on the Via di Francesco. We shared an advance copy of The Way of St Francis: From Florence to Assisi and Rome with Bill so he could check the itinerary and get back to us with comments and suggestions. Bill can be reached through his website and blog. Earlier this year my wife and I and a group of five others walked a section of the Via di Francesco, from Santuario della Verna to Assisi. That we were able to do it so capably, without once getting lost, was testament to Sandy Brown and his wonderful book, which I believe will become as essential to this walk as John Brierley’s guide is to the Camino Frances. Sandy also very kindly provided us with GPX coordinates which, once coupled to an app on our iPhones, meant we knew exactly where we were at any given moment. Sandy, thank you for making this pilgrimage so easy for us! We were all experienced pilgrims. We’d all previously walked the Camino Frances, and other Caminos too – but without doubt we would count the Via di Francesco as the most sublime, profound, and spiritual of any walk we’ve ever done. Why? Starting off in the monastery at della Verna certainly was a deeply moving experience. This is the place where St. Francis experienced his stigmata, and it’s a crucial part of his story. We stayed in the monastery the night before we began our pilgrimage. It was a wonderful introduction to the life of the saint. We participated in the traditional procession to the Chapel, which has happened each day at 3pm for centuries. It takes you from a small church through a covered corridor, the walls painted with frescos depicting the life of St. Francis. The following morning we set off, following instructions in Sandy’s book, and his GPX coordinates. For the next ten days we meandered our way south, through some of the most glorious country I’ve ever seen. I have to say of all the walks I’ve done, the Via di Francesco is by far the most scenic. At times you have to just stop and take in the wonder of what you’re seeing. 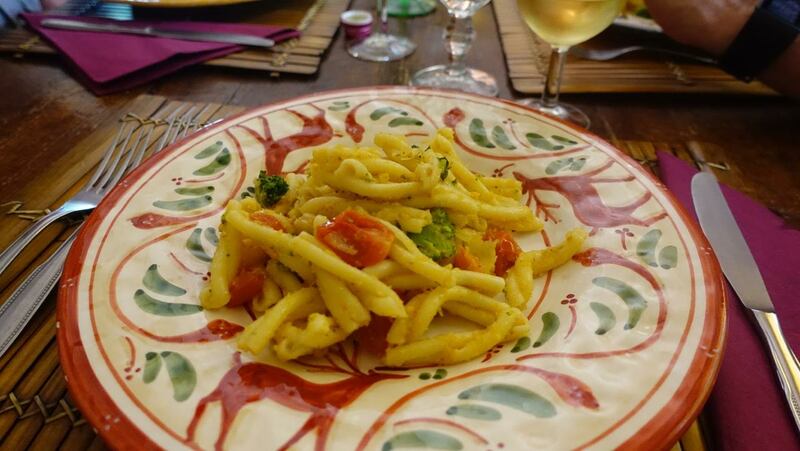 The walk also takes you through some wonderful Tuscan and Umbrian towns – and the food is incredible. Not expensive, but it’s the best Italian food I’ve ever had, and I’ve travelled extensively in Italy. Because we were a fairly large group we chose to stay in hotels – and so that dictated our stage lengths each day. With a fewer number we could have stayed in agriturismos, which are cheaper and get you closer to the local people. If I were to do the walk again, and I’m thinking of it because it was just so wonderful, I would definitely stay in these rural B&Bs. 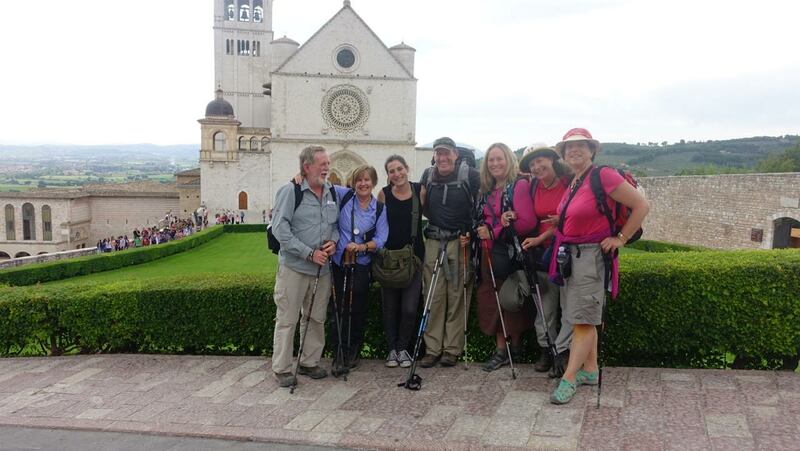 Reaching Assisi, and spending time in that sacred city, was the highlight of the walk. If you are seeking a spiritual experience, there is nothing more profound than going to St. Francis’s tomb at the Basilica. If you’re simply wanting to hang out in one of Italy’s most beautiful historic cities, then Assisi has everything you could want. Some months later now, the power of this pilgrimage stays with me. I have recurring memories of moments of exquisite beauty, and of a transcendent spirituality that is palpable on this walk. I would not have attempted this without Sandy Brown. I mean that. Knowing that the route had been meticulously tracked, and there was a guide book which I could constantly refer to, gave me enormous comfort. I found that the information in Sandy’s book was accurate often down to the metre! He even described barking dogs on one section, and as I walked along it, sure enough there were barking dogs! 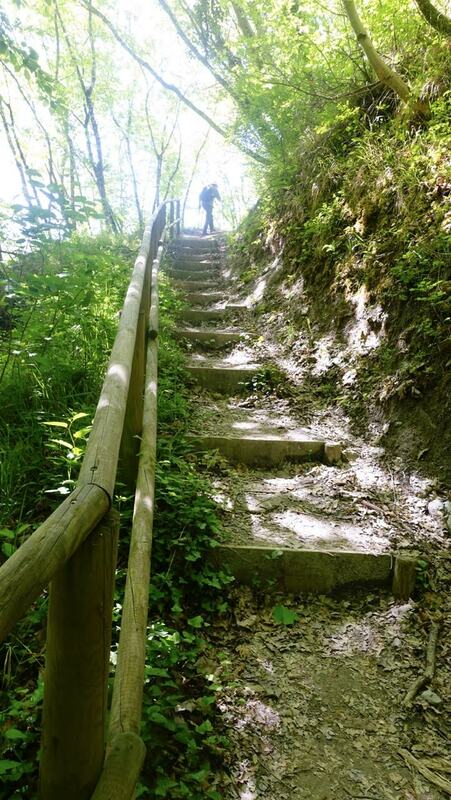 The Via di Francesco will never supplant the Camino Frances, however I believe it’s more beautiful, it’s just as profound as a spiritual journey, and it gives you the life and story of St. Francis, which will stay with you for the rest of your life – and beyond! Pilgrim chic — road ready at 6:45 a.m. When I got up this morning I wasn’t really sure I wanted to leave my bed, it being a national holiday and all that. But I’d already told Graciella and Luigi that I’d be heading out at 6:30 and I knew they’d think I was a slacker if I didn’t go. So…..out the door I went at about 6:45 for a day of adventure. Today’s goal, of course, was to research this pilgrimage walking stage — Perugia to Assisi — for my upcoming book. That meant that I’d be walking and dictating in my iPhone while taking photographs and trying not to get lost. Matter of fact, I didn’t get lost at all, mostly thanks to my GPS. I did discover, though, that I have much more to learn before I’ll be able to figure out the intricacies of this amazing little device. A big thanks to the folks at First Church Seattle who gave this to me as a going away present. I learned too that it’s a different way of walking when you’re walking as a pilgrim guidebook author rather than simply a pilgrim. Anyway, I made it to Assisi by about 3:00. It’s a great town, truly beautiful. I’ll be back in mid-July to research and write my chapter on Assisi, so for now it was just get some photos and get back home. Rather than entrust myself to the train schedule on a national holiday I opted to take a spendy ride back to Perugia by cab. As I was driven back to my temporary Perugian home I had time to reflect on the difference between walking 16 miles and riding the same distance in a car. The walk to Assisi was about smells and colors and discoveries and miniature hardships and thoughts of St. Francis who walked this way 800 years ago. The trip back to Perugia by car was mindless. And completely insulated from the world, which I sped through while gazing out the window. Leave Perugia through this gate. Gosh, some great vistas toward the south. Not too high, not too low. …by the cat and dog refuge…. … and under the freeway. Not that way, “that” way. What better way to say “I love you” than to deface some public property? I’m must find the name of this pink-striped church. A church with a church inside. St. Francis Basilica. up there. And up there some more. 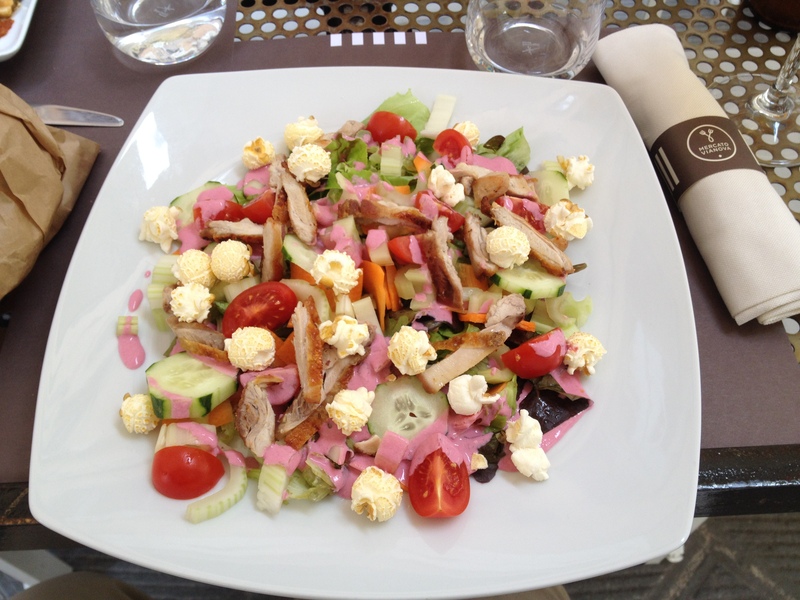 Yes, the dressing is pink and yes that is popcorn on my salad. Some days ago Patricia of Holland had said, “Since we’re both in town on Sunday, let’s go to the Steve McCurry exhibit that day.” I said, “Sure,” then completely forgot about it until she texted me this morning as I sat in the sunshine at a café on Corso Garibaldi. I was there, waiting for my clothes to finish drying at the Bolle Blu, a nearby coin-operated laundromat. When I packed for Perugia I was in something of a quandary about what to bring. 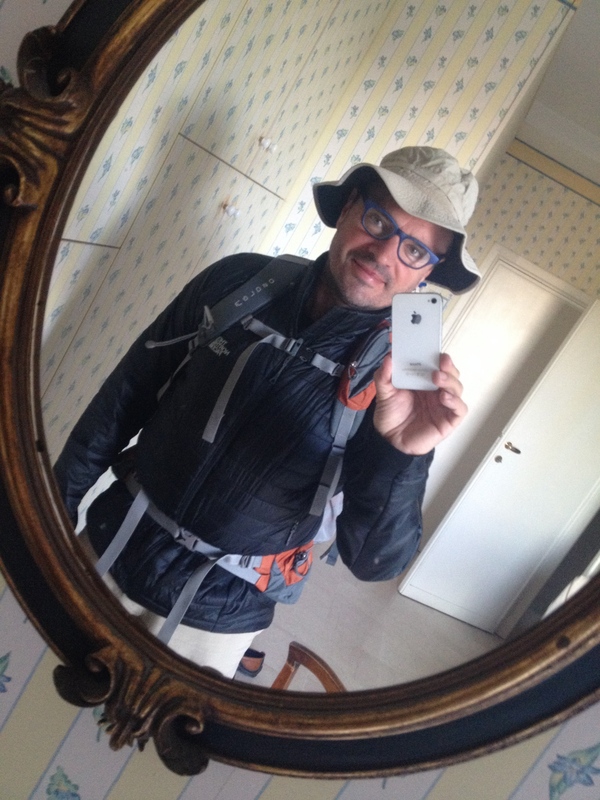 I knew I’d bring my hiking clothes for my July/August walking adventures, but I didn’t want to wear hiking clothes for a month of language study in Perugia. I also didn’t want to have a big suitcase I’d have to park somewhere while on camino. Theresa offered a modest sized — though flamboyantly Hawaiian — L.L. Bean duffel bag with wheels and it seemed just right for a modest amount of street clothes to wear while in Perugia. I realize now that having just two pairs of jeans, four t-shirts, three pairs of socks and six undershorts means I need to do wash about every 5-6 days. Graziella, my Perugian mom, is happy to do my wash, but on the Sunday of a three-day weekend I just couldn’t bring myself to ask. So I loaded up my clothes and wandered off to the Bolle Blu, where it took just an hour (and €8) to have the machines wash my clothes. With Patricia’s text I now had a somewhat more grand way to fill the day. After dropping off my clean clothes I met Patricia for a rather elegant lunch (see pic), and then headed down the hill with her to see the beautiful photographs of Steve McCurry. We all remember him as the photographer who captured the startlingly purple/blue eyes of the beautiful Afghan girl some years ago. I think the Umbrian Tourist Office commissioned him to take photos of Umbria for use in publicity since, though they were gorgeous, they did have a somewhat Chamber of Commerce quality to them. Still, I’d recommend the exhibit as a celebration of the art of photography and the beauty of Umbria. After gelato I dropped off Patricia with Esther of Holland and Ibrahim of Canada and headed out on my own to complete the Porta Sant’Angelo Itinerary from the Perugia walking guidebook. I walked toward the tall tower at Porta Sant’Angelo, noticed the familiar blue/yellow Via di Francesco way marks along the way, and as I walked I began to think ahead to my new plan for the rest of the weekend. Since tomorrow is my last free day in Perugia, and since I promised my editor I’d have a sample chapter to her by the end of June, this is my last chance to research a day’s walk. If I walk from Perugia to Assisi tomorrow I can get the info I need to create a sample chapter on this stage. This means 25.2 km (about 15.6 miles) on foot. I’ll walk there, take notes and photos — especially of Santa Maria Degli Angeli and the Basilica of St. Francis — and then find some way back. As I returned home late this afternoon I stopped at a tiny store and bought some crackers and fruit for the journey. This evening I’ll pack for tomorrow’s day of walking to the city of St. Francis. I feel a sense of satisfaction and joy that tomorrow, at least, I’ll be a pilgrim again, with the road under my feet. Below: photos from today’s walk through the medieval market, to the Steve McCurry exhibit, and off to Porta Sant’Angelo. Busker, maybe not with the world’s greatest voice. Gosh, what was happening in Italy in 1944? Yesterday’s taxi fiasco could have been averted by following the simple rule I learned in my first international trip: never agree to a taxi ride in an un-metered taxi without first negotiating the price. If only I’d followed another well-known rule of travel yesterday I would have saved a couple of hours of frustration. The rule? Never step onto a train without knowing for sure where it’s going. These are on every breakfast table in Italy and each packet is the equivalent of eating two hazelnuts! The day started well and ended well. I awoke early in La Girandola Hotel B&B near the Termini Station in Rome and cruised the Web while waiting for breakfast to be served in the eating area outside my room. This allowed me to research the top cell companies in Italy to see where and how I could get a SIM card for my iPhone. I discovered the TIM company is Italy’s largest cell provider and they have a store right in Termini Station. 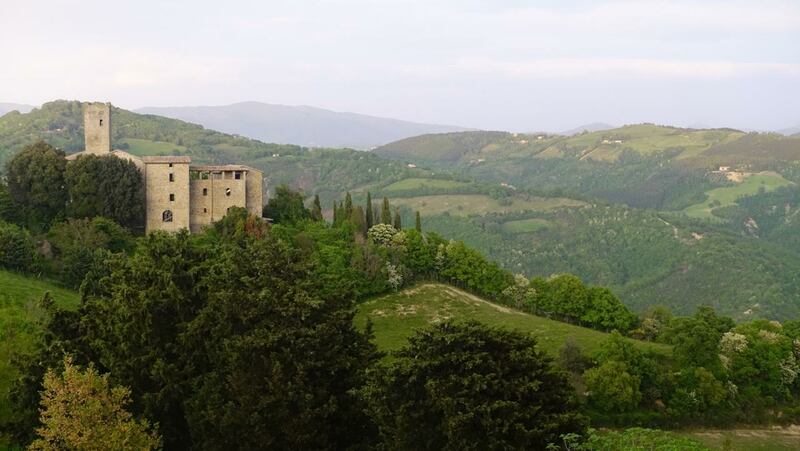 I also reserved my train ticket to Perugia, where I will get to the airport and pick up a rental car for a ride to the guest house where I’ll relax for a few days before language classes. I also bought my train ticket online — Rome to Foligno to Perugia. Simple. Breakfast time finally arrived (8:00 a.m. seems late when you wake up at 4:00 a.m.). “Ahh, yes,” I said to myself as I scanned the breakfast table. 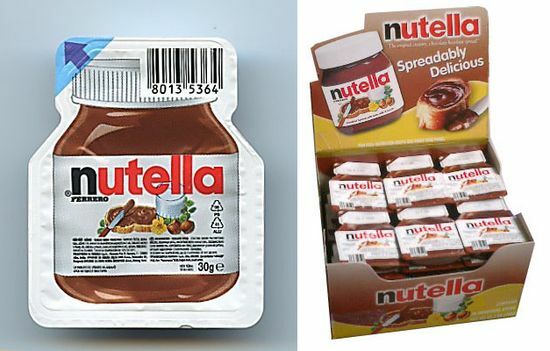 “Nutella®. I’m back in Italy.” One croissant and “the equivalent of four hazelnuts” later I was off with my bags to Termini. I picked up my new TIM SIM card and 10GB of monthly Internet (so I can use my phone as a hotspot for WiFi when necessary) and grabbed my train tickets from the machine with 45 minutes left to spare before my 9:35 train to Foligno. 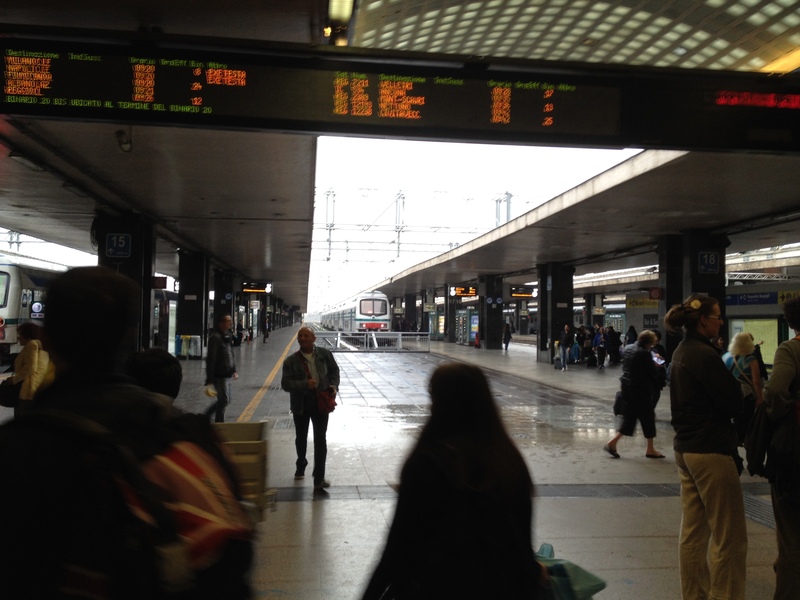 Waiting for the train at Termini Station in rainy Rome. On the train my mind went back to this same trip last year with Sebastian, my camino friend of 2011. 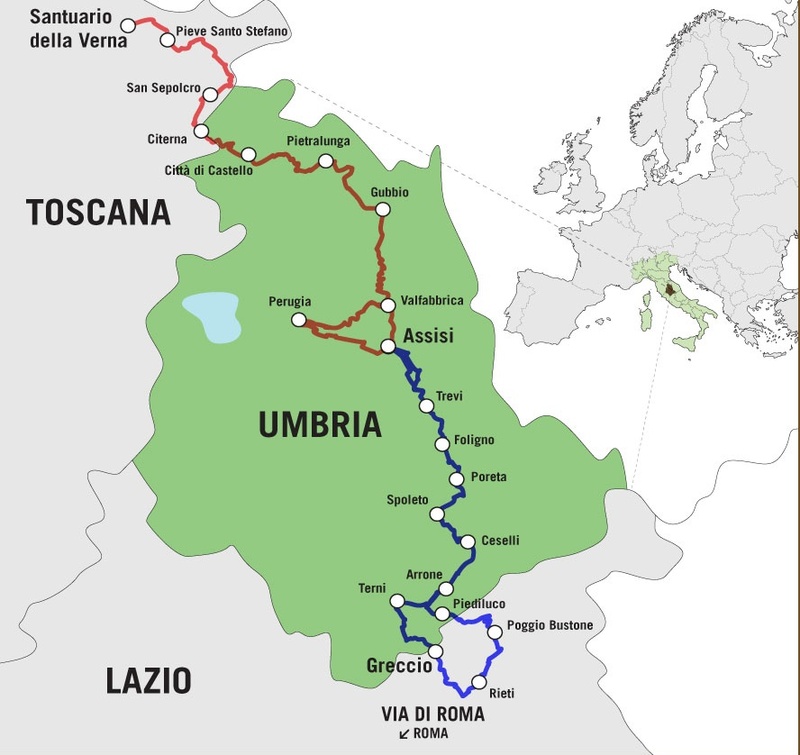 The route is notable for the many tunnels, which themselves are notable for the terrain, which itself is notable for what it means for pilgrims — to walk to Rome requires you walk over all those mountains that the trains go under. Indeed, Sebastian, Jacqueline, Andreas and I had walked those mountains in a quad-building pilgrimage that had taken us to Rome and was the genesis of the book I’d be writing this year. Two hours later the train arrived in Foligno, a flat, industrial town in the shadow of the Central Apennine range famous for gorgeous hill towns like Spoleto, Spello, Trevi and Assisi. At the station I checked the “Departures” board to see where I’d catch my Perugia train and dutifully went to Line 1 to wait. While I was grazing the glass cabinet of pizza slices and croissants in the adjacent cafe I heard the announcement, “[unintelligble]…[unintelligible]….Perugia….[unintelligible][etc. ].” I sprang for the door, ran down the stairs and across to Line 3, jumped on the train, settled in, and immediately realized — it was going the wrong direction. My first mistake was I hadn’t trusted my own reading of the Departures board. My second mistake was that I hadn’t realized that Italian train announcements always begin with where the train is coming from, rather than where it is going to. Not to mention that I hadn’t even learned any Italian prepositions yet, so I don’t know the difference between da and verso. With some newfound humility I climbed off the train back at Spoleto and saw on this station’s Departures board that I would have to cool my jets for an extra hour before I could get back to Foligno. Out of curiosity I called a cab to see what the fare would be to end my train adventure and get right to my rental car. The polite cab dispatcher offered the ride for a mere 100 Euros (about $140). An extra hour wait suddenly seemed ok.
Guesthouse near Gubbio, with views toward Lake Valfabbrica. Gorgeous Umbria. At 1:00 I was back on the train to Foligno, then after realizing the Perugia Airport is actually closer to Assisi, I transferred instead to St. Francis’ town, where I caught a 30 Euro cab to the airport. I picked up my rental car, and drove about 45 minutes to my delightful Gubbio guest house — at the end of a 4 km strada bianca (gravel road) with an amazing view of the Val di Chiascia. Highlight of the trip? A stop at a roadside cafe for a croissant — filled with delicious Nutella®. Oh, I also saw one large and beautiful deer I’d startled as I drove down the gravel road, plus a red fox who scampered across the gravel in advance of my tiny, white Citroën C1 rental. Here in the countryside I’m deprogramming from travel for a couple of quiet days while awaiting the start of Italian classes in Perugia and my home stay there with the Bertolini family. During this green and calm time I’m gathering my thoughts, reading and taking notes from the books I’ve carried from Seattle. My mind is moving from the busy past weeks in Seattle to the upcoming walk I’ll begin after language classes end next month. As I drove yesterday I saw out of the car window the familiar blue and yellow way marks of the Via di San Francesco walk. The walk I’ll write about is all around me here outside of Gubbio. 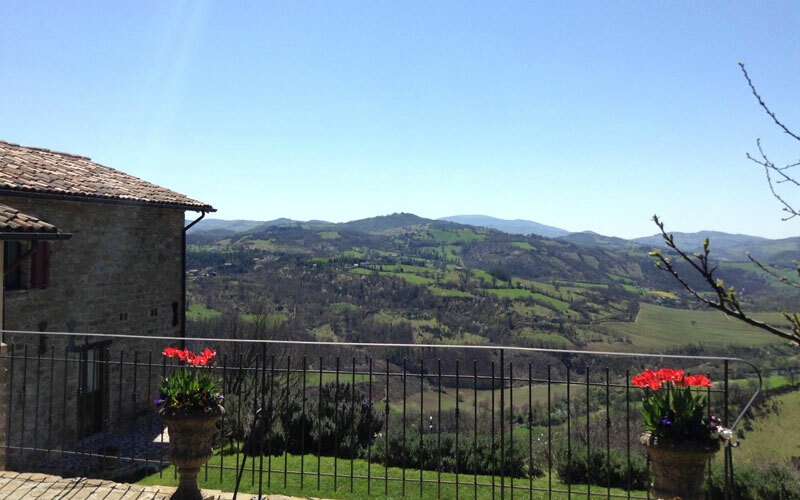 It stretches many miles north into the green hills around Sansepolcro and Santuario Della Verna and south past Assisi and across to the Nera River valley. The area is beautiful, and I’m happy to call it my home for these three months of learning, walking, writing and adventure. 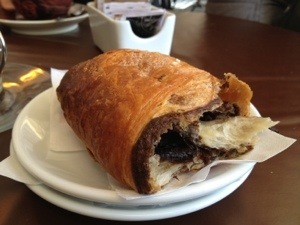 To me, a chocolate croissant is the perfect food to start a day of hiking — buttery-sweet calories with a chocolate center. Knowing that we had a 700 meter climb followed by a 900 meter descent ahead of us, I ordered two — guilt-free at breakfast, plus an orange juice and two coffees. I’d need all the energy I could get for this walk through the mountains above Assisi to the town of Spello. Jacqueline and Sebastian ambled down to the cafe below our hotel at about 7:30, and after their breakfast and a few words with some French pilgrims we headed out at about 8:00 under a blue Assisi sky. The blue and yellow waymarks led us up above town, so soon we were looking down on the ancient fortress that looms over Assisi. We realized that today’s route would lead us through the forested mountains above the town, likely giving us many vistas of the flat, green valley below. And so, we started walking up. Up through pine forests, up through thick brush, up past woodsmen with chainsaws. Up, up, up. An hour later we were certain we’d reached the top, then it was down a little ways and up, up again. I led the way at first, Jacqueline unusually slow, but when we finally reached the top, Jacqueline took the lead in the more difficult downhills. Most of the path was single track on sharp gravel, but some was also on the asphalt pavement of several remote, mountain roads. To our right were continuous views of the vast valley far below. At about noon, tired from the climbs and descents, we stopped for lunch at a small picnic area off the trail. Last night we’d bought some cheese, crackers and cherry tomatoes and we feasted on these as we rested our weary feet. 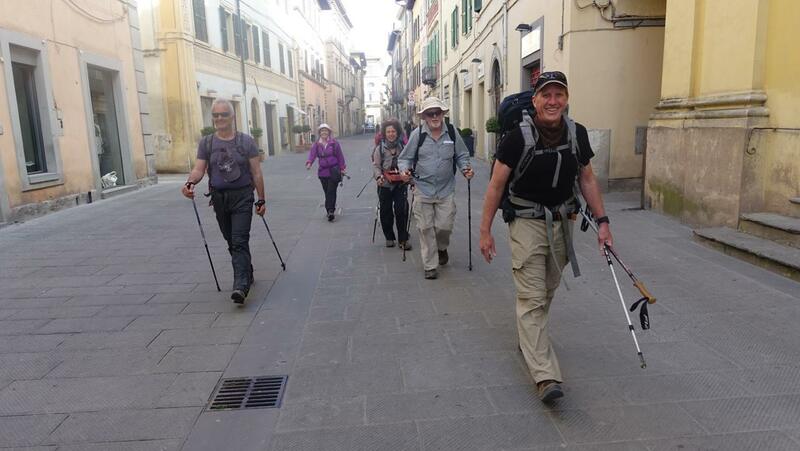 Here we were passed by a local Assisi couple out for a few days’ hike. 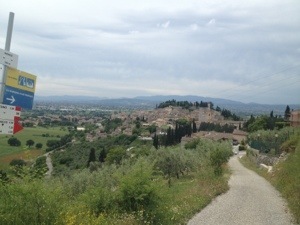 Then the trail led steeply down the mountain through olive orchards, finally meandering to the hill town of Spello. We weren’t certain if we’d stay in Spello or head the extra 7km to Foligno, but when we found the Albergo Il Cacciatore, with its lovely terrace and views of the valley, our evening plans were set. A beer, laundry, showers and a big spaghetti dinner would be perfect for these tired pilgrims. As Sebastian summarized the day over an afternoon beer, “Today was our first day of pain.” But what a lovely, painful day it was. Postscript: we walked down through town in the afternoon to do laundry at the automat and get groceries for tomorrow. Then it was a tasty dinner of pasta with wild asparagus and chicken in a white wine sauce. Off to bed then, with dreams of a short walk on flat ground tomorrow. Convent below, but the trail misses it. Red and white way mark shows one version of the way to Spello. Sebastian and Jacqueline, valley below. Great, double track trails downhill.